Twenty customer testimonials Scroll down. We deliver. Here's what some of our customers are telling us. My name is Tom Bicking, and I am the Chief of Charlestown Fire Company. Mike has asked me to give a few details regarding our operations at the Condo Fire in Perryville that happened at 0230 on April 1, 2018. I was officer on our new fire boat, and my assistant chief was our operator. The way this group of condominiums was situated there was no access for fire apparatus to gain access to the rear of the building. If there had been, they still would have had to park well outside the collapse zone due to heat, which minimizes how close you can get with hand lines, flow rates, etc. When we arrived, which by the way was only about a 10 minute response from Charlestown due to our new boat, the structure was fully engulfed. Upon arrival we joined Harford County Boat 5-2 from Havre De Grace Fire Company, and immediately placed into service our monitor which was flowing approximately 1500 gallons a minute for the 5 hours (approximately 450,000 gallons) or so we were on scene. The fire was so hot when we arrived we made a knock on the fire for approximately 15 minutes and as the air temperature got cooler, we moved in closer until we were tied off to the bulkhead flowing water from that location. I have no doubt in my mind the towns water system wouldn't have had enough water to fight this fire. Most likely this fire would have taxed any municipal water system. Having two fireboats employing their monitors was essential to extinguishing this fire, and keeping the heat dissipated, leaving the aerial apparatus on the municipal water supply free to manage a fog stream over the adjacent structures resulting in the adjacent buildings from getting to an ignition point. Without these two marine units I feel the fire loss would have been much greater. By the way, Havre De Grace Boat 5-2 was on location for close to 12Hrs yesterday, and at times they were operating both a portable deck gun and their monitor. If there had been docks where we were, we could have established a water supply by running a 5" supply line out the dock to our boat and furnished water to the attack pieces as well as fought fire. I am sure well over a million gallons of water were dumped on this fire over the course of the incident, which would have been impossible without these marine units. If you have further questions please don't hesitate to ask Mike or myself. We are more than happy to assist you however we can. Well, it’s been 18 months since the Wilmington Fire Department received delivery of our Firestorm 70' Multi-Mission Fireboat, so I felt I needed to give you a report on how the vessel performs. I say Multi-Mission because of how your design team and engineers fabricated a fast response vessel that has allowed our Marine Unit to perform not just, but all of the tasks required of them. Our Firestorm 70’ is equipped the same as a standard fire apparatus, including hose, SCBAs and forcible entry tools. In addition, we have 300-gallon foam concentrate, medical area for our BLS and medics to accommodate six stretcher patients, and all of our confined space rigging for rescue work. On board, we also have piped in supplied breathing air for crew members and piped in medical oxygen. Along with firefighting and assisting disabled vessels, we respond to industrial accidents on vessels, chemical / oil spills, medical assist and port security issues. With all this equipment onboard, the vessel is still making 41 knots, so our guys can get out to a situation faster and a lot safer than our previous 65-footer. To give you a short history on how Wilmington decided to use MetalCraft Marine, I was given the responsibility in 1996 to research funding and design a replacement vessel for our 65-foot fireboat we converted from a utility tug. All that work was performed in-house by firefighters mainly because of lack of funds to contract the work out. We started applying for grants in 1998 to replace the 30-year old vessel. In 2007, we were awarded a Port Security Grant, which came with a lot of restrictions and a very short time frame for fulfilling. I contacted approximately eight builders that specialize in fireboats to see what our options were. My initial contact with your company through Emily was memorable and truly characterizes the breadth of MetalCraft. I asked to talk to Bob Clark or someone else that may answer some questions about what MetalCraft had to offer. When Emily told me no one was around I assumed she would take my contact information down and have someone call me later. To my surprise, Emily started telling me more about your products and options than anyone in the other companies could answer on my first contact. She knew more about boats, designs and engine options, and I was pleasantly surprised about what a person answering an 800 number knew. Emily coordinated an appointment with Bob Clark, who I thought might just be another salesperson. Bob was just not another salesperson. I was impressed with his knowledge on design and cost. He could answer questions concerning cost and options on the spot. When he heard what our budget was, he assured us MetalCraft could build to the specifications of our Port Grant. Before MetalCraft started to build in 2011, our committee met with Ted Splinter, who was going to be the Project Coordinator at the yard, and went over the contract. We were fortunate that during our visit, you were in the process of building a 70-foot vessel for Boston, so we could walk around that project and see what changes we would like to implement. Ted started the groundwork on our vessel, and we felt comfortable with his expertise. Shortly after our boat was under construction, MetalCraft changed their project coordinator, and we were concerned his replacement would not meet our expectations. Well, along comes Jay Milner, and I cannot express in words how fast Jay got up to speed on our project and how attentive he was in keeping us informed on the progress. One of the big stumbling blocks Wilmington brought into this project was coordinating two separate grants in one build. Jay, along with your finance department and our finance Chief Carl Zipfel, worked above and beyond to coordinate the progress payments and keep this project on schedule. Even with all of the mechanical equipment and electronics of a vessel this size, I can say we had very few issues. Aside from a few minor mechanical and electrical issues we were able to repair in-house and a lighting issue Jay and Sean are currently working on, the vessel has exceeded our hopes. The Iveco engines and Hamilton Jets have performed well above our expectations, and all of the fire pumps and mechanical valves have been very dependable. The quality of workmanship and the pride of everyone in the company from the sales staff to the engineers, welders, electricians, project managers and owners shows through the finished project. I have 48 years of service in the fire rescue marine industry with the last 30 of those years with the Wilmington Marine Unit. I am a licensed Coast Guard Captain who has run several dinner boats and a charter boat. I have been around a lot of boat yards and mechanics, and I am very impressed with your operation at MetalCraft Marine. If at any time you need to show our vessel, please give us a call. I would like to tell you what a great company you have and the heart of it are the employees but most of all the leadership. From the person that answers the phone, sales, project managers and the employees that work on your vessel they show; caring ,concern, interest and a great sense of pride. As a customer you feel like you are not buying just a product you are buying a long term relationship. "Everyone Goes Home" Especially on a MetalCraft Marine Vessel. On behalf of the City of North Charleston Fire Department, I would like to send you a performance update for the FireStorm 32 built by MetalCraft Marine. Thus far, we have experienced superb customer service and performance from your company and their suppliers. Our dedication ceremony on July 4, 2012 of the "W. Frank New" was well received by all in attendance and the time Emily Roantree spent with the many dignitaries concerning our boat was greatly appreciated. A few of the minor issues we have faced with the FireStorm 32 are listed; but rest assured the professional manner in which they were handled has been exceptional. For example, our engines and jets issues were noted and were resolved without question by the manufacture. Some minor concerns we have noticed is with the air conditioner. The heat and humidity in South Carolina is not allowing the cabin to cool effectively. Having the boat on the water for over 12 hours on July 4th made us believe a larger unit would have greatly benefited our members. We also found that turning the heater fans on to circulate the air assists. We would suggest installing a strap across the door of the refrigerator to keep the door closed and the contents secure. When making sharp turns in rough water it slings open. We would also recommend non-skid tape (the same color as the roof) on the roof to keep members from slipping while walking on the top for their checks. After reviewing the wiring harness attached to the radar arch, we discovered it needs a protective cover to keep it out of the elements and wind; especially when operating at 43 knots. The areas that we are very impressed with are many, but I wanted to highlight a few. First, the deck hatches are designed with space in mind which affords us the room needed to perform daily checks and maintenance. The oversized hatch at the jets has served us well and is a design that should be touted. Having the sea chest on the main deck instead of the bilges is a blessing in disguise since it allows the debris to be easily cleaned out without having to climb into the bilge area. The dive, swim, and recovery platform has been the 'star of the show' for our dive team. This design, size and positioning has allowed the members easy access when getting in and out of the water. The grab handle slots, lip above the rub rail and the under hung grab rail affords the members ample leverage to pull themselves up after a long day of diving; not forgetting the height of the platform to the water which provides for a great working platform when doing recoveries. Since placing the boat in-service, we have responded to several calls. Our members have operated the boat at full throttle in 4 to 4.5 foot seas, without any major handling issues or negative feedback. We are continually on the waters of our jurisdiction providing our members training and educating our response partners and the general public. As a satisfied customer we would offer any future clients of MetalCraft an opportunity to discuss our FireStorm 32 and go under way with a member of our team. Once again, thank you and the MetalCraft Team for your dedication and excellence during the fabrication of the first FireStorm 32! From: Perry J. Ferrara Jr.
We can't thank you enough for the time you and Eric spent with us reviewing the Union Fire Company Marine Unit project. When we were told that we were coming up for a "hull inspection" we did not expect to see the project as far along as it is. I offer this information to you to explain the shocked looks on our faces for the few hours we were at your facility after seeing the new marine unit! You personally provided tremendous assistance to the Union Fire Company during the lengthy and sometimes complicated PSGP process. Without your quick and professional responses to our phone questions and e-mail information requests during our 18-month process we believe we would not have been able to adequately answer all the questions from the grantor. During Eric's visit to the Union Fire Company (where he put in an extremely long day) and at your facility (again a long day while he was managing numerous projects while speaking with us) he took time to address our concerns and provided tremendous guidance with the final specifications for the marine unit. During our inspection of the new marine unit, we could not say enough about the high quality of all the metal work we inspected. The quality of the work and the skill of the craftsmen who we observed working on our marine unit was extremely impressive. Often during the bidding process a manufacturer will speak highly of the quality of its product and construction techniques. Many times after a bid is awarded, the level stated by the manufacturer does not measure up to the statements when an on site inspection occurs. We were able to see for ourselves the high quality and professionalism during our visit to your facilities that was stated to us during the bid process. Not only were we permitted to inspect our new marine unit, we were permitted to look at all the other marine units under construction and inspect the quality of the work being performed. Please forward this e-mail to Eric and the appropriate officers of your company. Let me second the expression of gratitude Perry conveyed in his email to you regarding our visit to your facility Wednesday and Thursday. We were all impressed with your staff, the workmen and the progress made on our Marine Unit. There are not sufficient superlatives available in the english language to express our delight and satisfaction in what we saw. The quality of workmanship, the pride of your work force and the progress that has been made specifically on our unit was beyond anything I had envisioned during our drive up. To say that Vince, Perry and I were like three kids on Christmas morning who had hit the jackpot, would be an understatement. I have sent you an initial powerpoint presentation we have distributed to some of our officers and key supporters of the project, however, I would like to put together a more substantial presentation for our membership to be presented at our Company meeting on May 3. Could I impose on your and Eric to send me some additional photos of our Boat and possibly a few of the others in production to blow our guys away? Of particular interest are the Navy projects, the Boston and Camden Vessels. I promise not to steal any ideas or send them anywhere you don't want them to go. I will also copy you for use in promoting your fine craftsmanship. Thank you again for all your time and efforts in assisting us in bringing this project to fruition. First off I would like to say thank you to and your staff for producing the finest fireboat we have ever seen. I need to give you a little history of our fireboat purchasing project. We embarked on the mission of purchasing a new fireboat in January of 2000. We struggled to raise the appropriate funding for several years. Finally in 2008 it seemed like our long awaited dream was coming to fruition. We had received enough money to bid out the project. We had a great working relationship with MCM and its staff. We received our bids back and unfortunately, we were forced to use another manufacturer due to bidding laws in North Carolina. After a full year we received our boat, only to have it completely fail our acceptance tests. After months of dealing with lawyers and the other manufacturer, we finally terminated our contract. At this point we were able to move onto our first choice, MCM. From this point on, the process was nothing less than perfect. From start to finish we were 100% satisfied with everything that MCM did. From customer service to fabrication, MCM is second to none. Our former boat had stern drives which proved to be inappropriate for rescue operations. Our new Firestorm 30 with jet drives has been outstanding. In just a few short months since we have taken delivery, we have had the opportunity to use the boat on several rescues. The jets worked seamlessly. Its hard to imagine how we made it with stern drives for so long, needless to say we will never go away from jets. I look forward to talking to other fire departments and being able to share our story with them. MetalCraft Marine builds one of the finest fire fighting vessels I've seen. Once you've seen and operated the vessel, only then can you appreciate the quality and craftsmanship put into each vessel built. Every time the guys start a new project, they're making improvements to continually enhance each vessel to meet the customers need. When you get a call to respond to any type emergency incident on the water, time is critical and from a performance aspect the speed, durability and dependability are second to none. If you're looking for all of these qualities and more in a Rapid Response Fire Fighting type vessel, then MetalCraft Marine is a company that can meet those needs. The Firestorm 70' vessel we (Jacksonville Fire Rescue Department) purchased is a work of art in my opinion. The entire vessel was designed around performing multiple tasks. The layout of the helm is simple with defined stations for Helm operator, navigation and fire pump operations. Everyone from the sales staff, engineering, welders, project managers and owners are proud of the produce they manufacture and you can see it in their faces every time they launch a new vessel. Thanks for allowing me to comment on a great product and to be a part of producing a vessel like our new 70' Firestorm. The boat is in great shape. We have had it busy constantly for six days, and it is performing flawlessly. Two marinas were flooded and several docks had broken loose, and we were able to reposition those and secure them. We also had a barge on the river in downtown Nashville that is used for public events that had broken loose from it's mooring, and we used cables to re-secure it. 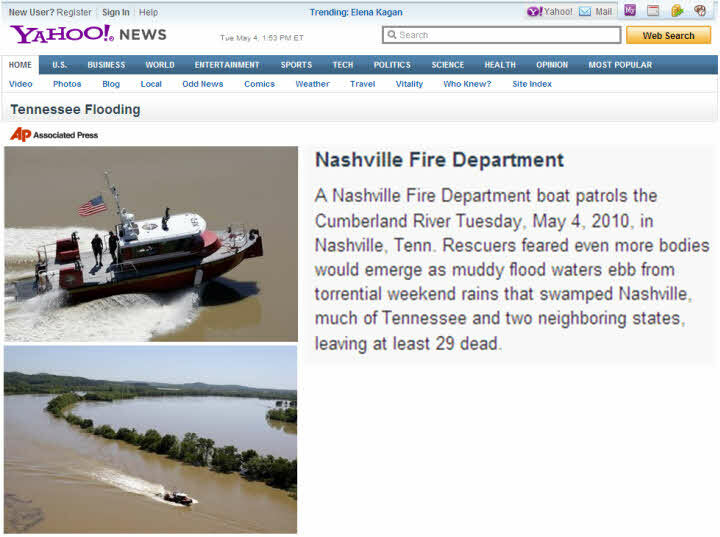 The Cumberland river crested over 14 feet above flood stage, and we had to move the boat to a marina downstream which is several miles from the riverfront area. Check out the link for pictures. On behalf of the City of Bridgeport I wanted to thank you personally along with your MetalCraft Marine staff, especially Emily and Eric in regards to your professionalism, dedication, craftsmanship and commitment in providing us our first ever fire boat. The boat is tremendous and will be a great asset to our community and State when dealing with issues pertaining to fire and search & search rescue operations. Eric was as professional as professional can be when dealing with a project of this nature. He truly exhibited a dedication and commitment to detail while providing us some great solutions for our boat. He truly exemplified why we would do business with MetalCraft again. We would be remised if we didn’t also extend a specific thanks to Emily and her commitment in keeping us updated on new projects at MetalCraft, helping to establish future contacts with other agencies, working closely with us on our travels, and for providing a dedicated professionalism as an indicator of the way business is handled there at Metal Craft Marine, she is a huge asset to your organization as shown in the commitment to her profession. Tom and Bob thank you both for the hospitality, your commitment to a public safety asset and for your dedication in providing a great vessel. I want to again thank you on behalf of the City of Bridgeport’s Office of Emergency Management & Homeland Security thanks again for our first ever City of Bridgeport Fire Boat. I am Phillip Brashear, the son of the late Master Chief, Master Diver of the Navy, Carl Brashear. Your company built a brand new fire-fighting water vessel for the city Newport News, Virginia in 2007. The city named the boat Carl Brashear in honor of my father. I wanted to thank your company for the great craftsmanship of your vessel and the honor you took in building it for the city of Newport News. I have been informed that the U.S. Navy decided to match your efforts and will name their newest Lewis and Clark class Logistical Support Ship the "Carl Brashear". I wanted to personally thank you for being the first to honor my dad with a great water vessel. Your company was the first to commission a boat for my dad and nothing can change that fact. I am very grateful to the Navy for their gesture and will treasure it also. I just wanted you to know how I felt. Good luck to your company in the future and may all of your future ventures be as successful as the ones you have enjoyed in the past. Congratulations on your 20th anniversary! Unfortunately, I will not be able to attend your 20th Anniversary Open House and Dinner Cruise in Kingston, Ontario on October 5-7, 2OO7. The Miami-Dade Fire Rescue Department reached a significant milestone this year as we placed our first MetalCraft 50' fireboat into service in January 2007. We are anxiously awaiting the delivery of our MetalCraft 36' fireboat in October 2007. We appreciate the outstanding customer service provided by your staff and look forward to many more years of our positive working relationship. On behalf of the City of Portsmouth Fire Department, I would like to extend our sincere appreciation for the workmanship and quality of our new 30’ Fire Boat. In November we came up to your facility to review the vessel as it was 90% to 95% done. After the three day adventure, we were thoroughly impressed with the design and operation of the boat. Now, here we are one week after delivery and are constantly reminded by our personnel and area fire service members that we selected a truly exceptional fire and rescue boat. Please relay our gratitude to the production crew, staff, and members of the management who were involved in designing and building our boat. I would like to especially recognize Gavin Jones, Project Manager, for his insight, honesty, and dedication throughout the building process, as well as the high quality training he provided our personnel upon delivery of the boat in Portsmouth. We still have a lot of work to do before the boat is in service, but that’s the fun part. As we look forward to a long and positive working relationship with you and you company, thanks again. I wanted to take a moment to send you and your staff a letter of thanks for the hard work and commitment shown in the purchase and construction of our Firestorm 30. My staff and I spent several years researching this project looking for the perfect vessel for the unique water conditions we experience. The committee was not encouraged with the products we found on the market during this time and feared we would end up with a product that did not address our needs. I still recall our first conversation with you on this project and how I felt that we had finally found not only a product, but a staff that would work with us to create a vessel that fit our needs. I do feel the need to share what I consider a classic story that truly speaks for your company and the product you build. While in the process of building the new Fire Boat we had a Fire Department out of a neighboring State visit us to purchase our old Fire Boat. During this meeting I made the mistake of "showing off" the plans of what Metal Craft what building to replace the old unit. Much to my dismay the next time I saw this Fire Chief was in Kingston Ontario, he was signing a contract with Metal Craft himself. He had never contacted us to advise us he would not be purchasing our unit and to see his face when we walked in was priceless. Please pass on my thanks to your entire staff who assisted with this process. I can not say enough about the service we received at all points during this endeavor, I have and will recommend your product to other Fire Districts who inquire. Good morning, I would highly recommend a MetalCraft boat to anyone and everyone. The fireboat that we have is the original FIRESTORM and it was our guys that had the dream of the vessel that started the process on this particular model. First, to be straightforward with you, I also have a company that performs some delivery setup and training for MetalCraft Marine. I can honestly tell you that I wouldn't have ventured into an agreement with MCM if I didn't believe in their product. I have watched them build several boats over the past four or five years and they absolutely take care of the customer. As for our boat, its a FIRESTORM 36, 5 years old, was refurbished last winter and still looks and runs great. Why was it refurbished already? MCM took care of us; since we were the first FIRESTORM built some changes have been incorporated on the latest versions for the better and MCM made those changes for us. We also took advantage and made a few changes that we have seen other make to their vessels. Examples; larger steering system, split fuel tanks for more equipment storage, improved mast, and we added a diesel 6kw generator. Our vessel definitely meets our standards. We have a large association of police and fire vessels on the Potomac River and I think you would be hard pressed to find someone that didn't want our vessel. After seeing ours, Fairfax, Alexandria and DC all purchased one. MCM sends most local (MD, NY, DE, NJ, NC, VA, SC, PA) to our area to see and ride on our vessels when they are considering purchasing one. That invitation is also open to you and your committee. I think you are absolutely on the right track by checking with current owners. Take the time to come down and see our vessel along with Fairfax (36), Alexandria (30), DC (30) and Annapolis (36) all within an hour or so of each other. You will see the same great construction and a world of differences (electronics and such) that each department incorporated by building off each others vessels and according to budgets. What would I do differently? Our committee traveled the country looking for a builder to build their dreamboat. Most builders said this is what we build, take it or leave it. MCM listened and designed our dream. We shot from the hip and didn't have anything to really look at and compare. I would take advantage of the fact there are several versions built and in service around the country and visit them. Incorporate the ideas these companies have improved or designed that fir your needs. Something I would add that I didn't? Maybe a foam system. We didn't put a foam system on board and still have not had the need, but we primarily run incidents involving pleasure craft and not ships. A foam system would be nice when the need arises. Any major problems with the dealer? No. I do know they seem to run fairly tight on their schedules. A question you didn't ask was about the jets? If you are considering jets (assuming you are with a 36'), the training can be apprehensive to some. We were very concerned along with some other purchasers. I mention this in case someone has already voiced this concern. Don't let this be a concern. We have developed a training program that teaches operators the basics and has them operating a jet boat with about 8 hours of operating time. I wouldn't purchase another fireboat with props if the use of jets were available for the location and task at hand. We currently run 2 jets; 36' MCM, 27' MCM. We also have a 19' ridged hull with an outboard and it has its uses, especially on smaller bodies of water that I can't get either of our jet boats to. Feel free to call me at the number listed below if you have further questions or want to arrange a time to visit. I have taken the liberty of sending this to you on letterhead to let you all know that your hard work and friendly, caring natures as you applied them in the building of our City's Patrol Boat have not gone unappreciated. I was very lucky to have done business with this boat and this company. Because ofthe levels ofknowledge, dedication, and flexibility shown by each and every employee I dealt with throughout the building process, I was able to obtain a world-class, superior product for the citizens of Annapolis for a very reasonable price. Also, the "stress and strain" of having a boat built was vastly reduced because I knew that my concerns and suggestions would be taken seriously, and I never had any doubts in the quality of the work or materials furnished. Since its delivery, the boat has done everything I specified and more. It has provided my office with a stable, robust, versatile, economical-to-operate platform for all operations from collecting mooring fees on a flat day, to salvaging vessels off a rip-rap wall in 25 knot onshore winds and assisting the local Coast Guard during special events. It is simple, dependable, and easy to operate. All of my assistants, and the local police who often ride with us, love it and are proud to operate it. Most people who have had the chance to be aboard during daily operations, even experienced boaters, are pleasantly surprised by the unparalleled maneuverability and sea-kindliness and have learned to love it very fast. In short, this boat shows an excess of every quality necessary for daily patrols and the types of emergencies we deal with. I do not feel that any duty we could throw at it would be a serious challenge to its capabilities - it's a clear cut csae of "the boat could take more than we can," which is a great position to be in for any outfit that has to operate a boat in varied duties for upwards of 5 hours a day, every day, year after year. I was the Contracting Officer Representative for the Panama Canal Commission for the construction of three vessels constructed by MetalCraft Marine Inc., and believe that I have a first hand knowledge of their abilities. During this project we found our dealings with MCM to be equitable, reliable and consciencous. They truly were striving to produce the best boat possible. During the building process many design changes were suggested both by PCC and MCM these changes made great improvements to the final product. The vessel met the contract specification and exceeded our expectations. PCC Dredging Division has also purchased two other vessels through CCC from MCM and found the same cooperation. The 54' – 42 passenger Crew Boat has been working in the Dredging Division of the Panama Canal Commission for approximately two years. To date we have not had any problems with the vessel, all aspects of the vessel were engineered to our needs, and the craftsmanship was carried out expertly and methodically. If you have any further questions regarding this vessel please contact me at telephone # 011-507-272-5549 (or Mr. Jorge De La Guardia at telephone # 011-507-272-6163). Wanted to drop you a line about our 22ft boat. I've used it for all one season now in all kinds of weather.... I've operated boats for over 40 years and this is the best rough water boat for its size I've ever worked with. We've used it for buoy maintenance, dock maint., shoreline cleanup, boat operator training, and in our dive program. The divers tell me that getting in and out of the water is very easy with the dive platforms, even with tank and weight belt on. The deck space and the gunnel height make working on buoys a snap. We transport buoy anchors that weigh about 1000 lbs. No problem! Thanks for the workmanship. You'll can be proud! I would also like to take this opportunity to thank you, Ron Potter, Tim Hastie, and Deborah Berry for all of the work done in connection with the unit's van. Constable Neil Finn has relayed that your service throughout the project was excellent and that the end result was extraordinary in the practical use of all available space. I would like to thank you and your organization for providing us with a tour of your facility on such short notice. We were quite impressed with the video presentation of the new C.C.G. vessel "Cape Sutil" and some of the other projects which were completed by your yard. We also found the short in-action sea trials of the new C.C.G. vessel very interesting. Ron and I found our visit to Metalcraft Marine extremely informative and beneficial. The pride you and your workforce have in your product is evident and justified. We greatly appreciate the assistance Wally Solonka provided North Cascades National Park Service Complex (NOCA) in the purchase of a new boat for Ross Lake. Wally's savvy and expertise in hull design and propulsion packages were very helpful as we finalized specifications for the new vessel. His familiarity with boat manufacturers helped steer us away from inferior products- and encouraged us to acquire the equipment we needed from a reputable manufacturer on GSA contract. Wally's visits to the manufacturer while the boat was under construction saved us unnecessary worry of contract oversight and allowed for minor improvements to be done at no cost. We can not overstate the value of Wally's involvement in this process. We took delivery of the boat in October. After its maiden voyage on Ross Lake, staff members agreed that we have added an extremely functional and valuable boat to our fleet. We are impressed with the design, craftsmanship and performance of this vessel. In all respects, it exceeds our expectations. Thank you for making Wally available to assist us. Without his solid support, we would not have been able to aquire a boat of such quality.